Pallas at a training seminar in 2019. Pallas gave her lifestyle a complete overhaul after the births of her daughters in 2002 & 2003, which accidentally led her to a career in massage therapy. 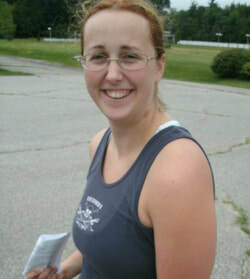 Pallas graduated from the Massage Institute of Cape Cod in July of 2005 and opened Oasis Massage that fall. She holds additional certifications in multiple styles of advanced massage & manual therapies. She taught at Cape Cod Community College from 2013-2014 as the professional massage tutor. She also received an Associate's Degree in Health Science from Cape Cod Community College in 2016. Aside from her kids & massage therapy, Pallas geeks out over gardening, food, martial arts & music. Pallas before participating in a Spartan Sprint in 2013.